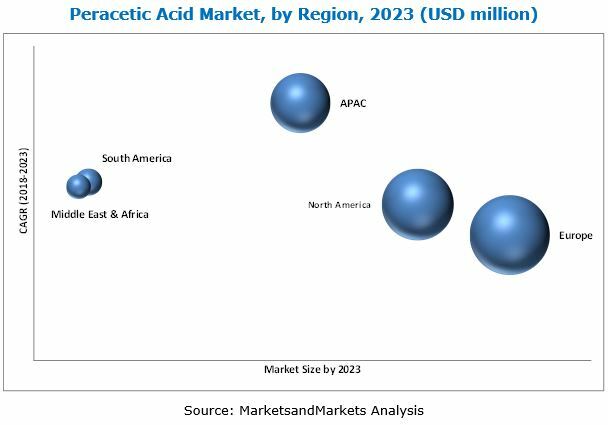 [118 Pages Report] Peracetic Acid Market size was valued USD 615.0 million in 2017 and is projected to reach USD 989.2 million by 2023, at a CAGR of 8.27%, during the forecast period. In this study, 2017 has been considered as the base year and the forecast period is 2018-2023. The report aims at estimating the size and growth potential of the peracetic acid market across application, end-use industry, and region segments. Factors such as drivers, restraints, opportunities, and challenges influencing the growth of the peracetic acid market have also been studied in this report. The report analyzes opportunities in the market for stakeholders and presents a competitive landscape of the market. Both top-down and bottom-up approaches have been used to estimate and validate the market size of peracetic acid and estimate the sizes of various other dependent submarkets. This research study involved the extensive use of secondary sources, directories, and databases, such as D&B Hoovers, Bloomberg, Chemical Weekly, Factiva, and other government associations. Moreover, private and company websites have also been used to identify and collect information useful for this technical, market-oriented, and commercial study of the peracetic acid market. After arriving at the total market size, the overall market has been split into several segments and subsegments. 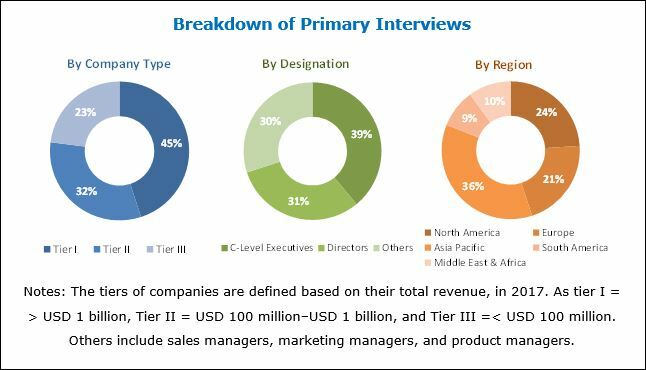 The figure given below provides a breakdown of primary interviews conducted during the research study, based on company type, designation, and region. This research report categorizes the peracetic acid market based on application, end-use industry, and region. The peracetic acid market size is estimated to be USD 664.9 million in 2018 and projected to reach USD 989.2 million by 2023, at a CAGR of 8.27%, from 2018 to 2023. The increasing use of peracetic acid in various applications, such as disinfectant, sanitizer, bleach, sterilant, industrial reagent, oxidizer, and polymerization catalyst is driving the growth of the peracetic acid market. The peracetic acid market has been segmented on the basis of application, end-use industry, and region. The peracetic acid market has been segmented based on application into disinfectant, sterilant, sanitizer, and others. The sterilant segment is projected to grow at the highest CAGR, in terms of value. Peracetic acid is an ideal sterilant due to its advantages, such as water solubility, leaving no residue after rinsing, and no harmful health or environmental effects. In fact, the food industry has adopted peracetic acid as a key material for sterilization method because of these beneficial properties and safety characteristics. The peracetic acid market has been segmented based on end-use industry into healthcare, food & beverage, water treatment, pulp & paper, and others. The water treatment segment is projected to grow at the highest CAGR, in terms of value, during the forecast period. This is because rising health awareness, increasing need for convenient water treatment, and stringent regulations by water treatment authorities are leading to the development and growth of the water treatment end-use industry. The peracetic acid market in Asia Pacific is expected to grow at the highest CAGR during the forecast period. Asia Pacific is a rapidly developing region with many emerging countries. This leads to many opportunities for industry players who are willing to invest in these areas. The rising demand for peracetic acid from the key industries such as food & beverage, healthcare, water treatment, and others, from India, China, Japan, among other countries, is projected to drive the growth of the peracetic acid market in the region. A major restraint in the peracetic acid market is the lack of awareness about the product. Consumers have very less knowledge about this product and its benefits in different application areas. In addition, the peracetic acid is expensive compared to its substitutes, such as hydrogen peroxide, chlorine, sodium hypochlorite, and calcium hypochlorite. This is a restraint in the growth of the market. Key players operating in the peracetic acid market include Solvay (Belgium), Evonik (Germany), PeroxyChem (US), Ecolab (US), Enviro Tech Chemical Services (US), Airedale Chemical (UK), Kemira (Finland), and Mitsubishi Gas Chemical Company (Japan).